Aid should be dropped by air into Burma if access to the cyclone-hit country does not improve, Conservative leader David Cameron has said. As concern grows at the limited relief reaching those in need, he said: "The sands of time are running out." 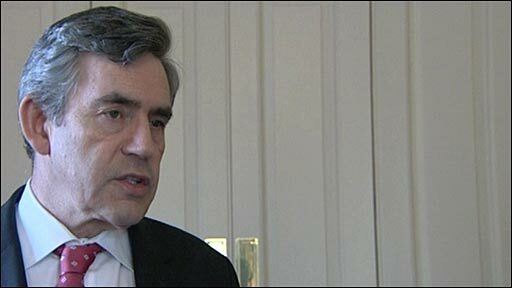 Gordon Brown urged the Burmese to give "unfettered access" to humanitarian agencies. The Royal Navy ship HMS Westminster is heading to the region. Burma's military rulers say they will accept foreign aid but not workers. Cyclone Nargis struck Burma nine days ago. The UN estimates the death toll in the country could be 100,000 or more. Burma's state media says 28,458 died and 33,416 are missing. Mr Cameron said he hoped direct air drops of aid would not be necessary. But he told BBC Radio 4's World at One programme: "If the situation hasn't radically improved by Tuesday, then we need to consider the further steps of direct aid being dropped to help people in Burma, and also looking to the United Nations about whether we can invoke the responsibility to protect. "If it's the case that the regime doesn't allow the aid to get through, then that is a crime against humanity." He said there were some good signs that more aid was getting through - but delivering aid by air or sea should not be ruled out. "In the end what matters is getting the aid through to people and feeding people to stop them dying ... up to five times as many people die in the aftermath of a natural disaster when it first strikes, if aid including food and shelter and medicine doesn't get through," he said. "So we're looking at a really calamitous state of affairs, and I think we should put the politics of all this second and think 'how best do we get the aid through?'" The prime minister, speaking at Downing Street, said Britain would use its chairmanship of the UN Security Council to press for action within the next day. "We now estimate that two million people face famine or disease as a result of the lack of cooperation of the Burmese authorities," he said. "This is completely unacceptable. There must be unfettered access to humanitarian agencies." He said Britain had committed £5m and had a humanitarian team in the former capital Rangoon to assess what could be done. HMS Westminster was en route to assist in humanitarian operations and a plane carrying plastic sheets was flying in to provide shelter. Asked whether aid drops were a possibility, he said: "We will look at every option - when two million people are facing suffering that is avoidable, we will look at every possible avenue for help." Liberal Democrat leader Nick Clegg also backed the idea of dropping aid directly into Burma "to show that we mean business as an international community". Will Burma keep its word on aid?